(c) to make further provision to implement, in part, the Al-Qaida and the Taliban Sanctions Resolutions. The Terrorism Suppression Act 2002 is New Zealand counter-terrorism legislation passed under the Clark-led Labour government. Enacted following the September 11 attacks, the Act was designed to better address contemporary terrorism issues, both domestically and abroad. As of April 2015, the Act has not been formally used in prosecution; however there have been several failed attempts by the Crown to do so. Many individuals and organisations have however been designated as "Terrorist entities" under the Act's provisions, in line with UN Security Council designations. The Act was amended in 2007. New Zealand, considered a relatively 'safe' country, has experienced few terrorist incidents in its short history. Prior to 2001, incidents included the bombings of the Huntly rail bridge in 1951, the Whanganui Computer Centre in 1982, the Wellington Trades Hall in 1984 and the Greenpeace vessel The Rainbow Warrior in 1985. Contrary to the popular association between terrorism and insurgency, the latter two of the four were perpetrated by state or state-aligned actors, as noted by Omar Hamed. Due to these incidents, New Zealand had already established prior to this act, "A comprehensive legislative and substantive counter-terrorist framework..." However the growth of international terrorism in recent years, alluded to by then Minister of Foreign Affairs and Trade Phil Goff in the bill's first reading, gave rise to the need to introduce new, "comprehensive" anti-terror legislation. The examples he gave were the Lockerbie bombing, the World Trade Centre bombing and the Nairobi embassy attack. Goff introduced the Terrorism (bombings and financing) bill to parliament on 3 May 2001. Seen by many as simply the enactment of two recent international conventions, the bill was considered unremarkable and garnered widespread lukewarm support. The bill was then sent to the Foreign Affairs, Defence and Trade select committee for review and submissions. The day of the attacks, a special ministerial statement session was held at the beginning of parliament, in which Deputy Prime Minister Jim Anderton, amongst others, gave their condolences for those killed, with Anderton moving a motion to express New Zealand's "shock and horror" at the events. What followed was a dramatic shift in pace at the select committee level, with many submitters feeling that they did not have enough time to review and make submissions on the increasing amendments that the committee was making in the wake of the attacks. Proponents of the bill claimed that this urgency was a matter of necessity given the threat posed by terrorism, however opponents claimed that this legislative process eroded the public's right to proper consultation. For instance in its submission on the bill the Women's International League for Peace and Freedom (Aotearoa), an organisation with consultative status with the United Nations, claimed to be, "dismayed at the extremely short length of time" and did not, "consider such a time period to be sufficient for...such a complex, and extreme, piece of legislation." This was echoed in the submission by the Human Rights Commission, stating that, "There has been limited opportunity for public discussion and preparation of submissions." Nonetheless, the New Zealand government, following several other governments around the world, broadened its own powers in the bill. Greener-Barcham claims that this was in order, "To be part of a broader anti-terrorist effort" and to, "Strengthen ties with 'like-minded states'" following the September 11 attacks and President Bush's call to arms. This shift in mentality was reflected in the bill's renaming from the Terrorism (Bombing and Financing) bill to the Terrorism Suppression bill. Due to the alterations made in the select committee stage, the bill became hotly debated during the committee of the whole house. For example, Green Party Member of Parliament Keith Locke proposed (unsuccessfully) an amendment which would have changed the bill's name to the, "Civil Liberties Reduction" bill. Despite strong dissent from the Green Party, the bill passed its third reading on 8 October 2002 with multi-party support and 106 votes in favour, with only the 9 Green votes against. The bill received royal assent and became an act on 17 October 2002. Part 1, "Preliminary Provisions," deals with the purpose of the act and its interpretation. The penalties within the act are severe, with most offences carrying either 14 years or life imprisonment (the harshest penalty available in New Zealand). ...Unable to authorise the prosecutions that have been sought under the Terrorism Suppression Act. There is insufficient evidence to establish to the very high standard required that a group or entity was planning or preparing to commit a terrorist act, as that term is defined in the legislation. As a result of this decision, the charges under the act were dropped as were any form of prosecution of the vast majority of those arrested. Only firearms charges against four of the accused were eventually successful. Because of Collin's criticism that the act was, "Unnecessarily complex" and, "Incoherent" he recommended the act be sent to the law commission for review. In doing so, the threshold to commit either offence was considerably lowered, in large part to correct the issues highlighted by the solicitor general. The Terrorism Suppression Amendment Act 2007 came into force on 19 November 2007. The Act as a whole has been criticised by some as placing too much power in the hands of the executive. Whereas the court formerly made findings of fact, in regards to the designation of terrorist entities the responsibility has been given to the prime minister. Such a designation carries with it strict penalties under the act in terms of association and membership. Some have claimed that this may lead to the act being used politically to quell dissidents rather than actual terrorists. Human rights groups have also raised concerns over whether convictions based on a wrongful designation will nevertheless remain upheld. The most recent periodic review of the act (in line with the review regime within the act) was cancelled in 2013 by then Justice Minister Judith Collins. Green Party co-leader Russel Norman claims this is because the government "is unwilling to risk further public scrutiny of the state's search and surveillance powers." ^ Hamed v R  2 NZLR 305. ^ "Lists associated with Resolution 1337" (20 July 2014) NZ Police http://www.police.govt.nz/advice/personal-community/counterterrorism/designated-entities/lists-associated-with-resolution-1373. ^ Terrorism Suppression Amendment Act 2007. ^ B.K. Greener-Barcham "Before September: A History of Counter-terrorism in New Zealand" (2002) Australian Journal of Political Science at 510-514. ^ Operation 8 (2011) Directed by Abi King-Jones and Errol Wright [Film] New Zealand: Cutcutcut films. ^ B.K. Greener-Barcham "Before September: A History of Counter-terrorism in New Zealand" (2002) Australian Journal of Political Science at 514. ^ (3 May 2001) 591 NZPD 9001. 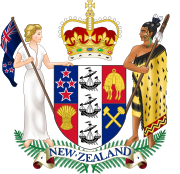 ^ New Zealand Council for Civil Liberties "Submission to the Foreign Affairs, Defence and Trade Committee on the Terrorism (Bombing and Financing) Bill 2001." ^ (12 September 2001) 595 NZPD 11614. ^ Women's International League for Peace and Freedom (Aotearoa) "Submission to the Foreign Affairs, Defence and Trade Committee on the Terrorism (Bombing and Financing) Bill 2001." ^ Human Rights Commission "Submission to the Foreign Affairs, Defence and Trade Committee on the Terrorism (Bombing and Financing) Bill 2001." ^ (08 October 2002) 603 NZPD 1090. ^ (08 October 2002) 603 NZPD 1148. ^ Terrorism Suppression Act 2002, ss1-6. ^ Terrorism Suppression Act 2002, ss6A-61. ^ Terrorism Suppression Act 2002, ss62-81. ^ David Collins, Solicitor General of New Zealand "Press Release regarding prosecutions under Terrorism Suppression Act" (Wellington, New Zealand, 08 November 2007). ^ Terrorism Suppression Amendment Bill 2007 (explanatory note). ^ Terrorism Suppression Amendment Bill 2007, s14. ^ Terrorism Suppression Amendment Bill 2007, s11. ^ Terrorism Suppression Amendment Bill 2007, s12. ^ Cameron Walker "The Terrorism Suppression Act" (1 April 2014) New Zealand Human Rights Blog http://nzhumanrightsblog.com/uncategorized/the-terrorism-suppression-act-and-criminalisation-of-national-liberation-groups/. ^ Adam Dudding "Review of terror laws stopped" (15 September 2013) Stuff http://www.stuff.co.nz/national/politics/9166763/Review-of-terror-laws-stopped.